In the last few months, NR Future, the crowdsourced placemaking community in New Rochelle managed by CSPM Group, outreached at various events: In October, they attended a Columbus Elementary School mother’s meeting, a meeting for the school children’s parents where the parents are all Spanish speaking. These conversations and meetings between NR Future and the community help to humanize the downtown revitalization and dispel inaccuracies. Later, they held a Halloween costume happy hour, supporting a local downtown business while conversing about the future of downtown New Rochelle. They then hosted a table at the final Farmers Market, offering free goody bags and face painting. NR Future also attended the City’s Arts & Cultural District Forum to be involved in the conversation surrounding this effort and to hear from the artists and organizations also aiming to carve out what this district should look like in the very near future. On October 13, 2015 the first public hearing for the downtown development project was held, with many speaking in favor of the project. It was one of the most widely attended and positive hearings that New Rochelle had ever seen. In September NR Future networked millennials at a Student Involvement Fair at both Iona College and The College of New Rochelle. 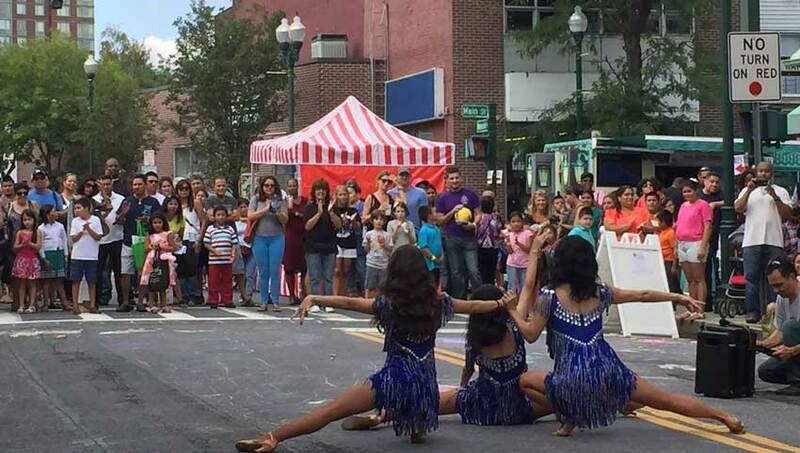 They also participated in The City of New Rochelle’s Street Fair where we were one of the event sponsors and hosted a tactical urbanism open streets activity zone, which was the City’s first. The open street consisted of several classes and activities for the community to participate in, free of charge. They had children draw on the street with sidewalk chalk, play games with hula hoops and bubbles that we also witnessed adults participating in. NR Future also launched a monthly ‘Action Grant’ program, awarding their first recipient, The New Rochelle Arts Collective. They utilized this grant to bring an installation to life, as a part of Arts Fest, entitled Living Room Inside Out. This installation was a wonderful demonstration of what this grant program can provide and ultimately received press attention, speaking to NR Future’s mission. This entry was posted on Tuesday, November 10th, 2015 at 20:13 and is filed under Blog. You can follow any responses to this entry through the RSS 2.0 feed. You can leave a response, or trackback from your own site.